Eureka! 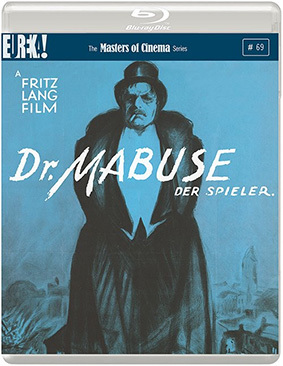 Entertainment have announced that they will be releasing Dr. Mabuse, der Spieler. [Dr. Mabuse, the Gambler.] on Blu-ray for the first time anywhere in the world as part of the Masters of Cinema series. Running at nearly 5-hours, the epic masterpiece by the legendary Fritz Lang (Metropolis, M, Das Testament des Dr. Mabuse), is the first part of his infamous and career-spanning Mabuse trilogy. One of the legendary epics of the silent cinema – and the first part of a trilogy that Fritz Lang developed up to the very end of his career – Dr. Mabuse, der Spieler. [Dr. Mabuse, the Gambler.] is a masterpiece of conspiracy that, even as it precedes the mind-blowing Spione from the close of Lang's silent cycle, constructs its own dark labyrinth from the base materials of human fear and paranoia. Rudolf Klein-Rogge plays Dr. Mabuse, the criminal mastermind whose nefarious machinations provide the cover for – or describe the result of – the economic upheaval and social bacchanalia at the heart of Weimar-era Berlin. Initiated with the arch-villain's diabolical manipulation of the stock-market, and passing through a series of dramatic events based around hypnotism, charlatanism, hallucinations, Chinese incantations, cold-blooded murder, opiate narcosis and cocaine anxiety, Lang's film maintains an unrelenting power all the way to the final act... which culminates in the terrifying question: "WHERE IS MABUSE?!" A bridge between Feuillade's somnambulistic serial-films and modern media-narratives of elusive robber-barons, Lang's two-part classic set the template for the director's greatest works: social commentary as superpsychology, poised at the brink of combustion. Dr. Mabuse, der Spieler. [Dr. Mabuse, the Gambler.] will be released on UK Blu-ray for the first time ever on 28th October 2013 by Eureka! as part of the Masters of Cinema series.